The Global Alliance Home Improvement Products Toronto showroom and warehouse, located in Southeast Ontario, offer our customers a comprehensive selection of high-quality flooring products for every room in their home. 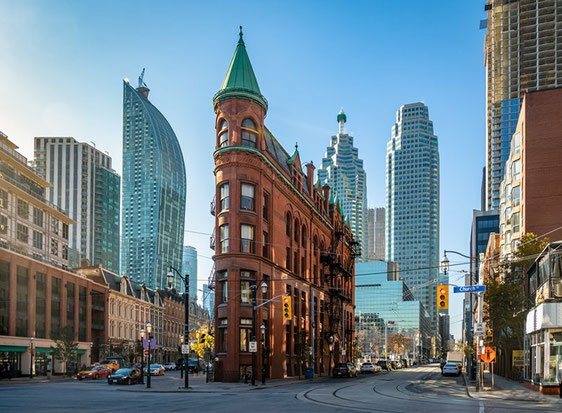 This central location is the hub from which we serve the nearby communities of Toronto, North York, Vaughan, Mississauga, Richmond Hill, Markham, Scarborough and Brampton. When you visit our showroom, we know you'll be impressed by the clean, spacious, well-lit and attractive environment we've designed as a pleasing backdrop to our line of home improvement products. In these pleasant surroundings, we're sure you'll find the prospect of choosing your new flooring a relaxing and inspiring one. When seeking dependable service and high-quality products from among the flooring stores Toronto features, smart local homeowners, interior decorators and building contractors choose Global Alliance. If they've done their homework, they know that our knowledgeable consultants, uniquely personalized service, and extensive lineup of flooring and finish-work products add up to greater convenience and more consistent customer satisfaction. From well-designed door trim to the finest-quality hardwood flooring, we offer an impressive inventory of home improvement products that's as varied as it is attractive, allowing every customer to choose the design that will create the exact look their construction or renovation project calls for. When installing hardwood floors Toronto homeowners often also need materials for redoing their stairs and railings. At Global Alliance, we offer a variety of stylistic options to help you create the most visually appealing hardwood stairs, letting you make each stair a work of art by pairing it with the right decorative accessories. You can be sure we'll always have the right accessories on hand since our warehouse is right on site. At Global Alliance, the hardwood flooring Toronto customers recognize, from top Canadian manufacturers, represents decades of experience, hectares of well-stocked forests, and strict quality standards in the design and manufacture of these home improvement products. Offering a variety of different regional climates, Canada is home to a number of forested areas, each of which produces its own unique type or variety of hardwoods. These forests help ensure that Canada's flooring manufacturers are supplied with sufficient raw material for the wide array of attractive flooring designs they create that allow every customer to select a design that fits their individual decorative needs, taste and budget. Global Alliance is proud to bring to our customers the results of the fine artisanship of the skilled craftsmen who develop these lines of top-flight wood flooring products. Because Canadian timber is known for being so strong, due to the country's colder climate, our customers can rest assured that our flooring products that are manufactured from these hardwoods will be durable and long-lasting. They can also be confident that these floors come from forests that are protected by forest management practices that are among the most highly sustainable in the world. This timber and these sustainable forestry practices are helping to put Canada on the map—and as a result, they are helping to put the Global Alliance Toronto flooring products showroom on the map, as well. When considering the type of hardwood flooring Toronto homeowners prefer, it's important to recognize that many may not be aware of which type will actually work best for their situation. At Global Alliance, we carry both types because we realize that each type offers key advantages and key benefits in certain specific situations. We know that flooring is a specialized industry that can be difficult for the average consumer to understand, and this is why the professional home improvement specialists who work at our Toronto showroom—as well as our other stores—are trained to explain the differences and help each customer determine whether engineered hardwood is the right choice for them. Certain environments and applications will tend not to favor the engineered version of this popular flooring option simply because the hardwood veneer that is glued to the top of a plywood, hardwood or high-density fiberboard core could be compromised under certain conditions, causing the veneer to curl. However, in other situations this flooring choice would be ideal and could even be more durable than solid hardwood. 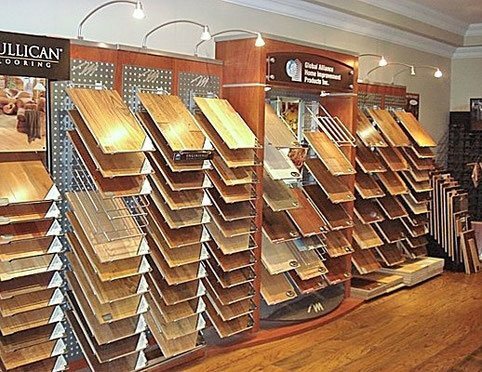 Our flooring experts would be happy to discuss your situation and help you make the right choice. Our engineered wood design options are many, offering you the beauty of a wide variety of solid hardwoods in a flooring product that's specially engineered to offer specific advantages for your 21st century home and lifestyle. Laminate floors can be an attractive yet affordable choice for those who want the look of hardwood without the higher price tag. At Global Alliance, we offer a comprehensive selection of laminate flooring products that offer beauty and durability along with easy maintenance. Specially designed and manufactured from several fused-together layers, laminate is a flooring option that many Toronto area homeowners prefer. This space age flooring product features a top layer that consists of a high-definition image of a specific variety of hardwood, in relief, basically tricking the eye into viewing it as the real thing. Closer inspection, of course, does reveal the difference. However, today's highest-quality laminates are very attractive and make a wonderful alternative to their more-costly cousins. These products can make a very smart choice for budget-conscious local consumers who also have a well-developed aesthetic sense. In fact, they often actually grow to become the laminate flooring Toronto homeowners love. For those who are in the market for flooring that's easy to clean and simple to maintain yet also durable, attractive and affordable, vinyl may be just the thing. Though they've been around since the middle of the 20th century, today's vinyl floors offer greater durability, easier installation and a wider variety of textures and patterns that make them right at home in 21st century homes. They also offer flooring options that are certified to meet specific indoor air quality standards, making them easier on allergy sufferers and others with respiratory conditions as well as healthier overall. The vinyl flooring Toronto residents use in their kitchens, bathrooms, hallways, nurseries and other parts of their homes is just one more flooring category that is well-represented in the Global Alliance Toronto showroom. We have many patterns and textures and other features to choose from that allow us to totally customize your flooring choice. Our flooring experts are always standing by to help you make the crucial decisions that make all the difference to the beauty and practicality of your home décor. At our Toronto showroom, we offer one of the widest varieties of carpets Toronto residents will find anywhere in the area. We're proud of our extensive selection that offers something for everyone. Regardless of your decorating goals, we have the appropriate look, fiber, texture and color profile to help you create the precise atmosphere you envision for your décor. Again, our experts are always standing by to help you make the crucial decorating decisions that will help you get the most beauty, enjoyment and satisfaction from your home. We help you create an environment in which you can thoroughly relax and enjoy your own home and yet just as easily make a favorable impression while entertaining guests. We think you'll be pleased by the wide array of choices available to you when you browse our carpeting samples. We're sure you'll also be pleased to know that for the carpets our Toronto area customers purchase, we offer you the option of taking advantage of our prompt, courteous carpeting installation service. Our showroom offers an extensive selection of home improvement products that lets you find virtually everything you need for your remodel in one place. And that includes all the edging and other finish-work pieces you'll require to adorn your walls, doorways, windows and other parts of your home. Aside from offering you the flooring products that help you create an attractive home, we also carry the door trim, baseboard and other decorative moulding that help you make that new flooring shine. Offered in a variety of designs and styles, our door casing, crown moulding and similar products add a stately beauty to your home, making it look much more regal for an unexpectedly low price. Our consultants can help you create a pleasing design by combining these pieces in the right way to express your personal aesthetic sensibilities. The Global Alliance warehouse is conveniently located in close proximity to our Toronto showroom. This allows us to keep an extensive inventory of home improvement products always at the ready to serve the needs of every customer's new construction or home renovation project. Storing such a wide range of products safely in our own warehouse is one way we help ensure the efficiency of your flooring installation project. By storing these products on the premises and simply restocking our showroom as needed, we help you avoid the inevitable delays that the need to re-order out-of-stock items would create, saving you time, money and stress. At Global Alliance, we take your project seriously. We understand that your time is valuable, that you generally need to coordinate with others to successfully complete your installation and that your renovation or new home construction project is on a timetable. That's why we've designed our business in such a way that we can more easily work together with you to help keep your project on schedule. Factors like our competitive pricing, free estimates and professional installation service give our company an edge over others that charge more and deliver less. At Global Alliance, our goal is to provide every customer with a smooth, seamless, uncomplicated experience that adds value to their project, their home and their lives. We believe that true professionalism means competently handling all the details on our end to help simplify the complexity on your end. Once we've done that, we know you'll be freer to focus on the more creative aspects of your remodel. And that's when your whole outlook toward your renovation can take on a brand new element of excitement and renewed enthusiasm for the task. That's one key reason why, in addition to offering great pricing and personalized service, we're so dedicated to providing all the flooring Toronto could possibly need. If you're planning a remodel anytime in the near future, please consider visiting our Toronto showroom soon. We truly think you'll be impressed.